Today, the world produces—mostly from low-input, smallholder farms—more than enough food: 2,900 calories per person per day. Per capita food availability has continued to expand despite ongoing population growth. This ample supply of food, moreover, comprises only what is left over after about half of all grain is either fed to livestock or used for industrial purposes, such as agrofuels. Despite this abundance, 800 million people worldwide suffer from long-term caloric deficiencies. One in four children under five is deemed stunted—a condition, often bringing lifelong health challenges, that results from poor nutrition and an inability to absorb nutrients. Two billion people are deficient in at least one nutrient essential for health, with iron deficiency alone implicated in one in five maternal deaths. The industrial model of agriculture—defined here by its capital intensity and dependence on purchased inputs of seeds, fertilizer, and pesticides—creates multiple unappreciated sources of inefficiency. Economic forces are a major contributor here: the industrial model operates within what are commonly called “free market economies,” in which enterprise is driven by one central goal, namely, securing the highest immediate return to existing wealth. This leads inevitably to a greater concentration of wealth and, in turn, to greater concentration of the capacity to control market demand within the food system. Moreover, economically and geographically concentrated production, requiring lengthy supply chains and involving the corporate culling of cosmetically blemished foods, leads to massive outright waste: more than 40 percent of food grown for human consumption in the United States never makes it into the mouths of its population. Consider the current use of water in agriculture. About 40 percent of the world’s food depends on irrigation, which draws largely from stores of underground water, called aquifers, which make up 30 percent of the world’s freshwater. Unfortunately, groundwater is being rapidly depleted worldwide. In the United States, the Ogallala Aquifer—one of the world’s largest underground bodies of water—spans eight states in the High Plains and supplies almost one third of the groundwater used for irrigation in the entire country. Scientists warn that within the next thirty years, over one-third of the southern High Plains region will be unable to support irrigation. If today’s trends continue, about 70 percent of the Ogallala groundwater in the state of Kansas could be depleted by the year 2060. Industrial agriculture also depends on massive phosphorus fertilizer application—another dead end on the horizon. Almost 75 percent of the world’s reserve of phosphate rock, mined to supply industrial agriculture, is in an area of northern Africa centered in Morocco and Western Sahara. Since the mid-twentieth century, humanity has extracted this “fossil” resource, processed it using climate-harming fossil fuels, spread four times more of it on the soil than occurs naturally, and then failed to recycle the excess. Much of this phosphate escapes from farm fields, ending up in ocean sediment where it remains unavailable to humans. Within this century, the industrial trajectory will lead to “peak phosphorus”—the point at which extraction costs are so high, and prices out of reach for so many farmers, that global phosphorus production begins to decline. Beyond depletion of specific nutrients, the loss of soil itself is another looming crisis for agriculture. Worldwide, soil is eroding at a rate ten to forty times faster than it is being formed. To put this in visual terms, each year, enough soil is washed and blown from fields globally to fill roughly four pickup trucks for every human being on earth. The industrial model of farming is not a viable path to meeting humanity’s food needs for yet another reason: it contributes nearly 20 percent of all anthropogenic greenhouse gas emissions, even more than the transportation sector. The most significant emissions from agriculture are carbon dioxide, methane, and nitrous oxide. Carbon dioxide is released in deforestation and subsequent burning, mostly in order to grow feed, as well as from decaying plants. Methane is released by ruminant livestock, mainly via their flatulence and belching, as well as by manure and in rice paddy cultivation. Nitrous oxide is released largely by manure and manufactured fertilizers. Although carbon dioxide receives most of the attention, methane and nitrous oxide are also serious. Over a hundred-year period, methane is, molecule for molecule, 34 times more potent as a heat-trapping gas, and nitrous oxide about 300 times, than carbon dioxide. Our food system also increasingly involves transportation, processing, packaging, refrigeration, storage, wholesale and retail operations, and waste management—all of which emit greenhouses gases. Accounting for these impacts, the total food system’s contribution to global greenhouse gas emissions, from land to landfill, could be as high as 29 percent. Most startlingly, emissions from food and agriculture are growing so fast that, if they continue to increase at the current rate, they alone could use up the safe budget for all greenhouse gas emissions by 2050. Social history offers clear evidence that concentrated power tends to elicit the worst in human behavior. Whether for bullies in the playground or autocrats in government, concentrated power is associated with callousness and even brutality not in a few of us, but in most of us. The system logic of industrial agriculture, which concentrates social power, is thus itself a huge risk for human well-being. At every stage, the big become bigger, and farmers become ever-more dependent on ever-fewer suppliers, losing power and the ability to direct their own lives. The seed market, for example, has moved from a competitive arena of small, family-owned firms to an oligopoly in which just three companies—Monsanto, DuPont, and Syngenta—control over half of the global proprietary seed market. Worldwide, from 1996 to 2008, a handful of corporations absorbed more than two hundred smaller independent companies, driving the price of seeds and other inputs higher to the point where their costs for poor farmers in southern India now make up almost half of production costs. And the cost in real terms per acre for users of bio-engineered crops dominated by one corporation, Monsanto, tripled between 1996 and 2013. Not only does the industrial model direct resources into inefficient and destructive uses, but it also feeds the very root of hunger itself: the concentration of social power. This results in the sad irony that small-scale farmers—those with fewer than five acres—control 84 percent of the world’s farms and produce most of the food by value, yet control just 12 percent of the farmland and make up the majority of the world’s hungry. The industrial model also fails to address the relationship between food production and human nutrition. Driven to seek the highest possible immediate financial returns, farmers and agricultural companies are increasingly moving toward monocultures of low-nutrition crops such as corn—the dominant US crop—that are often processed into empty-calorie “food products.” As a result, from 1990 to 2010, growth in unhealthy eating patterns outpaced dietary improvements in most parts of the world, including the poorer regions. Most of the key causes of non-communicable diseases are now diet-related, and by 2020, such diseases are predicted to account for nearly 75 percent of all deaths worldwide. What model of farming can end nutritional deprivation while restoring and conserving food-growing resources for our progeny? The answer lies in the emergent model of agroecology, often called “organic” or ecological agriculture. Hearing these terms, many people imagine simply a set of farming practices that forgo purchased inputs, relying instead on beneficial biological interactions among plants, microbes, and other organisms. However, agroecology is much more than that. The term as it is used here suggests a model of farming based on the assumption that within any dimension of life, the organization of relationships within the whole system determines the outcomes. The model reflects a shift from a disassociated to a relational way of thinking arising across many fields within both the physical and social sciences. This approach to farming is coming to life in the ever-growing numbers of farmers and agricultural scientists worldwide who reject the narrow productivist view embodied in the industrial model. Recent studies have dispelled the fear that an ecological alternative to the industrial model would fail to produce the volume of food for which the industrial model is prized. In 2006, a seminal study in the Global South compared yields in 198 projects in 55 countries and found that ecologically attuned farming increased crop yields by an average of almost 80 percent. A 2007 University of Michigan global study concluded that organic farming could support the current human population, and expected increases without expanding farmed land. Then, in 2009, came a striking endorsement of ecological farming by fifty-nine governments and agencies, including the World Bank, in a report painstakingly prepared over four years by four hundred scientists urging support for “biological substitutes for industrial chemicals or fossil fuels.” Such findings should ease concerns that ecologically aligned farming cannot produce sufficient food, especially given its potential productivity in the Global South, where such farming practices are most common. 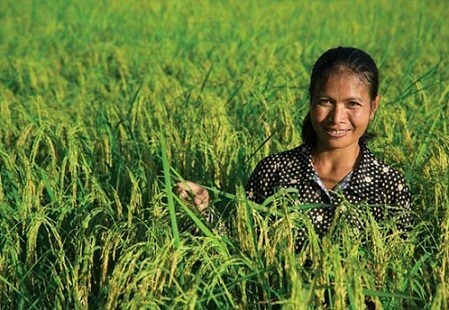 In another positive social ripple, agroecology is especially beneficial to women farmers. In many areas, particularly in Africa, nearly half or more of farmers are women, but too often they lack access to credit. Agroecology—which eliminates the need for credit to buy synthetic inputs—can make a significant difference for them. Agroecological practices also enhance local economies, as profits on farmers’ purchases no longer seep away to corporate centers elsewhere. After switching to practices that do not rely on purchased chemical inputs, farmers in the Global South commonly make natural pesticides using local ingredients—mixtures of neem tree extract, chili, and garlic in southern India, for example. Local farmers purchase women’s homemade alternatives and keep the money circulating within their community, benefiting all. Once citizens come to appreciate that the industrial agriculture model is a dead end, the challenge becomes strengthening democratic accountability in order to shift public resources away from it. Today, those subsidies are huge: by one estimate, almost half a trillion tax dollars in OECD countries, plus Brazil, China, Indonesia, Kazakhstan, Russia, South Africa, and Ukraine. Imagine the transformative impact if a significant share of those subsidies began helping farmers’ transition to agroecological farming. Any accurate appraisal of the viability of a more ecologically attuned agriculture must let go of the idea that the food system is already so globalized and corporate-dominated that it is too late to scale up a relational, power-dispersing model of farming. As noted earlier, more than three-quarters of all food grown does not cross borders. Instead, in the Global South, the number of small farms is growing, and small farmers produce 80 percent of what is consumed in Asia and Sub-Saharan Africa. Originally published on the Economics of Happiness Blog at https://www.localfutures.org/farming-small-planet/. 3. Vaclav Smil, “Nitrogen in Crop Production: An Account of Global Flows,” Global Geochemical Cycles 13, no. 2 (1999): 647; Dana Gunders, Wasted: How America Is Losing Up to 40% of Its Food from Farm to Fork to Landfill (Washington, DC: Natural Resources Defense Council, 2012), http://www.nrdc.org/food/files/wasted-food-IP.pdf. 4. United Nations Environment Programme, Groundwater and Its Susceptibility to Degradation: A Global Assessment of the Problem and Options for Management (Nairobi: UNEP, 2003), http://www.unep.org/dewa/Portals/67/pdf/Groundwater_Prelims_SCREEN.pdf; Bridget Scanlon et al., “Groundwater Depletion and Sustainability of Irrigation in the US High Plains and Central Valley,” Proceedings of the National Academy of Sciences 109, no. 24 (June 2012): 9320; David Steward et al., “Tapping Unsustainable Groundwater Stores for Agricultural Production in the High Plains Aquifer of Kansas, Projections to 2110,” Proceedings of the National Academy of Sciences 110, no. 37 (September 2013): E3477. 5. Dana Cordell and Stuart White, “Life’s Bottleneck: Sustaining the World’s Phosphorus for a Food Secure Future,” Annual Review Environment and Resources 39 (October 2014): 163, 168, 172. 6. David Pimentel, “Soil Erosion: A Food and Environmental Threat,” Journal of the Environment, Development and Sustainability 8 (February 2006): 119. This calculation assumes that a full-bed pickup truck can hold 2.5 cubic yards of soil, that one cubic yard of soil weighs approximately 2,200 pounds, and that world population is 7.2 billion people. 7. FAO, “Greenhouse Gas Emissions from Agriculture, Forestry, and Other Land Use,” March 2014, http://fao.org/resources/ infographics/infographics-details/en/c/218650/; Gunnar Myhre et al., “Chapter 8: Anthropogenic and Natural Radiative Forcing,” in Climate Change 2013: The Physical Science Basis (Geneva: Intergovernmental Panel on Climate Change, 2013), 714, http://www.ipcc.ch/pdf/assessment-report/ar5/wg1/WG1AR5_Chapter08_FINAL.pdf. 8. Sonja Vermeulen, Bruce Campbell, and John Ingram, “Climate Change and Food Systems,” Annual Review of Environment and Resources 37 (November 2012): 195; Bojana Bajželj et al., “Importance of Food-Demand Management for Climate Mitigation,” Nature Climate Change 4 (August 2014): 924–929. 9. Philip Zimbardo, The Lucifer Effect: Understanding How Good People Turn Evil (New York: Random House, 2007). 10. Philip Howard, “Visualizing Consolidation in the Global Seed Industry: 1996–2008,” Sustainability 1, no. 4 (December 2009): 1271; T. Vijay Kumar et al., Ecologically Sound, Economically Viable: Community Managed Sustainable Agriculture in Andhra Pradesh, India (Washington, DC: World Bank, 2009), 6-7, http://siteresources.worldbank.org/EXTSOCIALDEVELOPMENT/Resources/244362-1278965574032/CMSA-Final.pdf. 11. Estimated from FAO, “Family Farming Knowledge Platform,” accessed December 16, 2015, http://www.fao.org/family-farming/background/en/. 12. Fumiaki Imamura et al., “Dietary Quality among Men and Women in 187 Countries in 1990 and 2010: A Systemic Assessment,” The Lancet 3, no. 3 (March 2015): 132–142, http://www.thelancet.com/pdfs/journals/langlo/PIIS2214-109X%2814%2970381-X.pdf. 13. Jules Pretty et al., “Resource-Conserving Agriculture Increases Yields in Developing Countries,” Environmental Science & Technology 40, no. 4 (2006): 1115; Catherine Badgley et al., “Organic Agriculture and the Global Food Supply,” Renewable Agriculture and Food Systems 22, no. 2 (June 2007): 86, 88; International Assessment of Agricultural Knowledge, Science and Technology for Development, Agriculture at a Crossroads: International Assessment of Agricultural Knowledge, Science and Technology for Development (Washington, DC: Island Press, 2009). 14. Cheryl Doss et al., “The Role of Women in Agriculture,” ESA Working Paper No. 11-02 (working paper, FAO, Rome, 2011), 4, http://fao.org/docrep/013/am307e/am307e00.pdf. 15. Gerry Marten and Donna Glee Williams, “Getting Clean: Recovering from Pesticide Addiction,” The Ecologist (December 2006/January 2007): 50–53,http://www.ecotippingpoints.org/resources/download-pdf/publication-the-ecologist.pdf. 16. Randy Hayes and Dan Imhoff, Biosphere Smart Agriculture in a True Cost Economy: Policy Recommendations to the World Bank (Healdsburg, CA: Watershed Media, 2015), 9, http://www.fdnearth.org/files/2015/09/FINAL-Biosphere-Smart-Ag-in-True-Cost-Economy-FINAL-1-page-display-1.pdf. 17. Matt Walpole et al., Smallholders, Food Security, and the Environment (Nairobi: UNEP, 2013), 6, 28, http://www.unep.org/pdf/SmallholderReport_WEB.pdf.